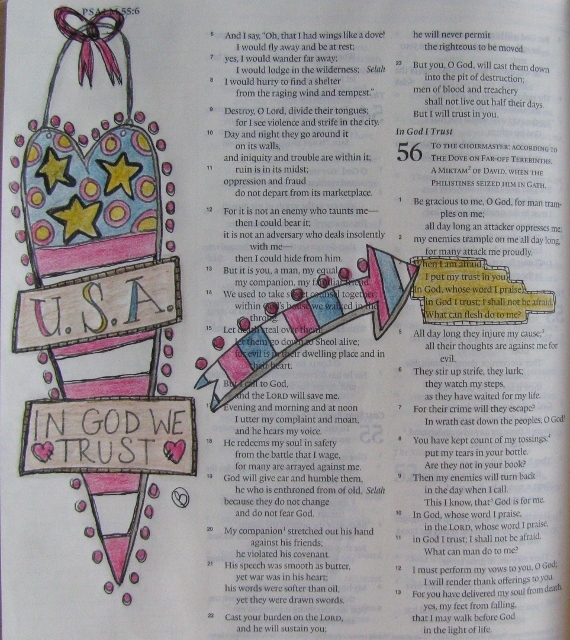 I've been regularly working on my Bible journaling, so today I thought that I'd share a few more of my entries with you. 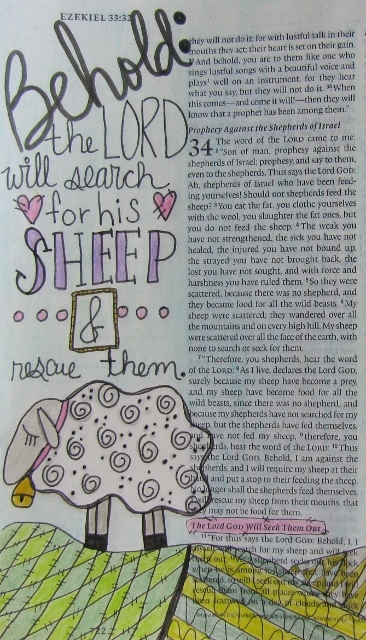 First up is from Ezekiel 34:11 - 12, "For thus says the Lord God: Behold, I myself will search for my sheep and will seek them out. As a shepherd seeks out his lock when he is among his sheep that have been scattered, so will I seek out my sheep and I will rescue them." Because I am blessed with friends that I truly treasure, this short verse from Proverbs 17:17 is near and dear to my heart: "A friend loves at all times." I am a pretty patriotic person, so the next two entries highlight my love and pride for my country. 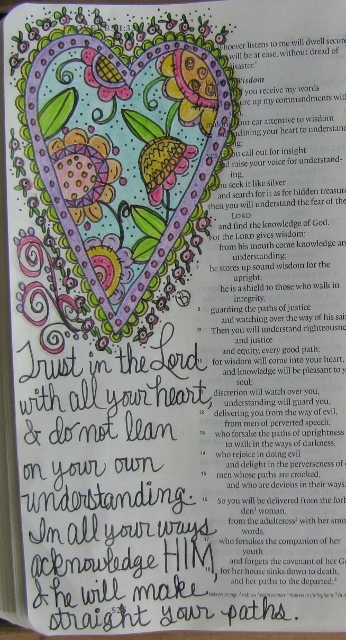 First up is the verse from Psalm 56:4-5, "When I am afraid I put my trust in you. In God, whose word I praise; in God I trust; I shall not be afraid. What can flesh do to me?" 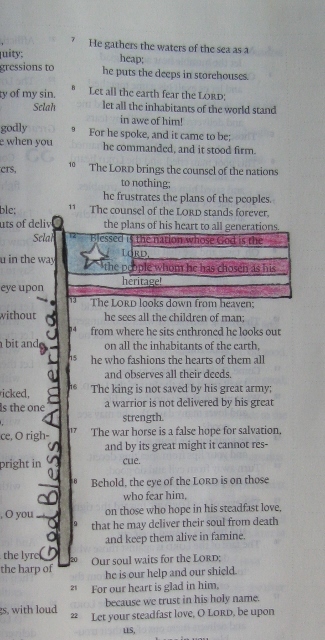 Psalm 33:12 "Blessed is the nation whose God is the Lord, the people whom he has chosen as his heritage!" 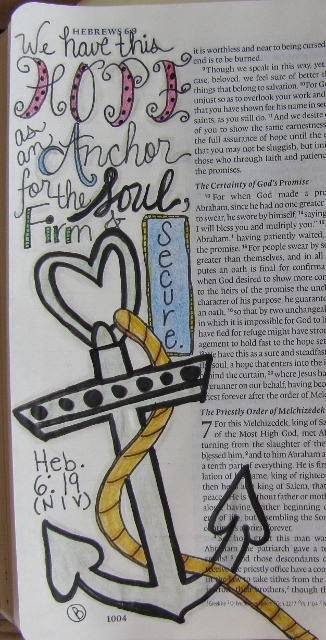 Up next is a verse about hope being an anchor for our soul from Hebrews 6:19 (NIV), "We have this hope as an anchor for the soul, firm and secure." And as my final entry for this post, another of my very favorite verses: "Trust in the Lord with all your heart, and do not lean on your own understanding. In all your ways acknowledge Him, and he will make straight your paths." Proverbs 3:5-6.